Evening everybody. I’ve had an eventful weekend so far – on Saturday morning I received a red letter from a debt collection agency saying that they I owed £2,500 to NPower Northern. As I have a card meter in my house for both the electric and the gas, I was pretty sure that it was a mistake, but I still panicked a little when I opened it, and felt sick when I read it. Anyway, I rang the debt collection company and apparently they have on their records that I am still living at an address in Birmingham, which I left 8 years ago. They have on their record that I moved out in 2012. Luckily I can prove that I haven’t lived their for 8 years obviously, and the company emailed NPower to tell them this and now I just have to wait for a letter to tell me what to do next – I may have to send written proof apparently. It’s quite creepy thinking someone has probably been using my ID and annoying as well – I guess its one of those faceless crimes that people commit – not thinking about the effect it has on the person – if I was vulnerable, or old, or not well educated I think the letter would have been even scarier. Anyway – this wasn’t a great start to my Saturday morning but after sorting this out, I headed over to Lancaster to run a workshop ‘Starting to Publish’ for Lancaster Spotlight. I really enjoyed the workshop and I hope people got something out of it. It’s the third time I’ve done the workshop – I’ve ran it for Leeds Writers Circle and at Ledbury Poetry Festival as well – it’s probably my favourite workshop to run because I think its really exciting to see these poets who are just starting out at the beginning of their writing usually – most of them haven’t submitted to magazines before and they have all of that excitement to come – well I found it exciting submitting anyway – I know not everybody feels like this! Afterwards I had a really nice meal with Kevin McVeigh and his friend Sarah and then I was off again to Kendal to go to Ann Wilson’s Open mic event at the Brewery in Kendal. I really enjoyed this as well – there were poets as well as prose writers and Antony Christie did a cracking set to finish off the end of the night. Today’s Sunday poem is by Rachel McGladdery. I met Rachel first of all at Lancaster Spotlight – I remember her performing from memory a fantastic, moving poem about her father. She read this poem recently at the Estuary Anthology reading in Grange and I love it. She’s very good at writing portraits of people – I think she really gets to the essence of people in her poetry – if that makes sense. I normally don’t like poems about people’s children either – I find them very boring normally – but there are exceptions and this is one of them! I find this very moving – and it’s not just about a child, I don’t think. I think it’s also about what it means to grow up in our society, what it means to grow up as a female in our society…I also like Don Paterson’s poems about his twins. They’re not boring. ! Rachel McGladderylives in rural Lancashire. She has 4 children, 2 cats and a dog. Rachel regularly performs at live literature events around the North West and has both poetry and reviews widely published online, in anthologies, most recently the soon to be launched ‘Sculpted’ and also in magazines. She won the Lennon Poet 2010 competition, awarded by Carol Ann Duffy. She is currently working on her first collection and poetry source material for use in schools and she says she would love to hear from prospective publishers willing to offer HUGE sums of money in order to stop her from having to get a proper job. to your friends, and me. the narration of your life when you think that no-one’s listening. of growing up and in’s not far away. Hi everyone. I’ve just finished teaching for the day – a long long day – six schools and then I helped out a friend with his school band after school – and then three more pupils at home. I’m so tired I feel a bit sick – BUT! looking ahead to next Tuesday – I’m reading in Maulds Meaburn and there is also a wonderful guitar player called David Ashworth who will be playing guitar – you can find out more info about him and the event by clicking on the link below which will open up a lovely poster for the event, but it basically starts at 7.30pm in Maulds Meaburn Village Institute, 26th Feb, £6 on the door and it would be lovely to see some of you there. but there are also videos on Youtube of the Rain of Poems over London this summer. Anyway, this set the children up nicely to go and plant their poems around the school, in the absence of a helicopter. We watched two Michael Rosen videos as well, which they loved. The teacher said he’d had a great morning and off I went – feeling completely different to how I’ve felt before after I’ve finished teaching. I know I’m a good brass teacher – I get good results – I have two overflowing junior bands – but I want that thing that happened on Monday to happen again! And this is also part of good teaching too – the constant redefining and learning about your own teaching practice – and hopefully the constant improving as well. Now I have a high standard to live up to – I want more of my music lessons to be like that – I will have to find a path towards creating this I think and I know if I manage to recreate that atmosphere in a lesson again, whether it is music, or poetry, I will feel it – the crackle in the air. To get to the Sunday poem today, you will, unfortunately have to read through my half-term holiday round up as well. I’ve been on holiday all week and although this sounds relaxing, it has been filled – or maybe a more accurate adjective would be stuffed with poetry things. Saturday of course was the marvellous, marvellous Tony Curtis at Poem and A Pint. We had a great audience at the event and Tony was on fine form – a masterclass in how to deliver a poetry reading. Then Monday to Wednesday was the residential at Abbot Hall. It was an intense, exciting and inspiring three days. I really enjoyed every minute of it. The group of 15 poets who had signed up were very different – some were very experienced writers and others were complete beginners and then everything in between. But the group did seem to gel really well and they were very supportive of each other. The manager of Abbot Hall has already booked us to do another poetry break next year which is amazing. I can’t wait. The dates, if you want to get them in your diary are the 13th – 17th April and the tutors will be me and Jenny again. There are also tentative plans afoot for a residential in one of the other hotels in the chain – and I already have some ideas for tutors to work with – so as soon as I get confirmed details I will post them on here. On Thursday I went for lunch in Grasmere with the lovely Andrew Forster and met the new Poet-in-Residence Judy Brown who is also lovely. Then I headed back over to Grange and walked from Kents Bank to the old open-air swimming pool near Grange with the dogs and then back again to the hotel for a reading in the evening for the Estuary anthology that I’m in, organised by Agnes Marton, one of the editors. On Friday I had a meeting with Ron Creer who runs Adult Education classes in South Cumbria – I’m doing an all-day creative writing workshop for him on March 9th at Grizebeck Village Hall for his creative writing groups. I’m really looking forward to this and it was nice to catch up and talk over some ideas for the day. And then yesterday I went to a workshop at Grasmere with David Morley who managed to cram more into a one day workshop than I could in a week. I found it completely inspiring – the best bit of the workshop was when we were told to go and leave poems around Grasmere – I made a hedgehog out of moss and wrote a little poem to go on a piece of paper that the hedgehog sat on – someone else wrote a poem and put it in the parking meter – there were poems stuck underneath windscreen wipers of cars, posted through the front door of the local junior school – and I’ve decided I’m going to get the kids in my poetry workshop that I’m running tomorrow to do something similar. I haven’t planned the workshop yet – I’m going to do it after doing this post – but today the hubby and I have been at Millwood, walking the dogs and we started off collecting leaves and twigs as I had a vague idea to do a workshop on something to do with the environment. When we got to the stream though I realised there were lots of bits of broken pottery in the stream that were much more interesting than a load of moldy old twigs so we started gathering those up – well the hubby did most of it, and I directed from the safety of the bank. So the workshop is going to evolve hopefully, around these bits of pottery and the children ‘poetrybombing’ their school – I want them to leave poetry around in unusual places for the other children and teachers in the school to find. So that was my week – filled with poetry which is lovely, but probably a little bit too busy. Next week, apart from work is going to be a bit quieter. In fact, I don’t think I have one thing on in the evenings, so I’m planning on catching up with some of my Poetry Business Writing School tasks and doing lots of reading and maybe a little bit of writing. Today’s Sunday poem is by Mark Carson. Mark is another of my favourite poetry people. He lives in Ulverston and is a Poem and A Pint committee member and he does the Job That I Would Least Like To Do – the accounts. Bleurgh. But he does it very well and brings colourful spreadsheets and fancy graphs to each meeting we have, and these are much appreciated. As well as being good with numbers, Mark is also a great poet. I think he has a very distinctive style – you can always tell a poem by Mark. Mark is also very humble – even by a poet’s standards, so I thought it would be nice to let the spotlight shine on him for this week. He reached Cumbria thirty years ago as an offshore engineer and birding has been an abiding interest since he spent four years in Kenya, where, he tells me, you could see four species of eagle before morning coffee. The poem that I’ve chosen comes from a lovely little handmade pamphlet that Mark sent through the post to me, probably a couple of years ago now entitled ‘Rapture’. This poem is my favourite in a sequence of Raptor-in-Action poems that make up the pamphlet. I hope you enjoy it – this poem came from a photograph Mark saw of a sparrow-hawk hunting pigeons in the middle of a crowded town centre. 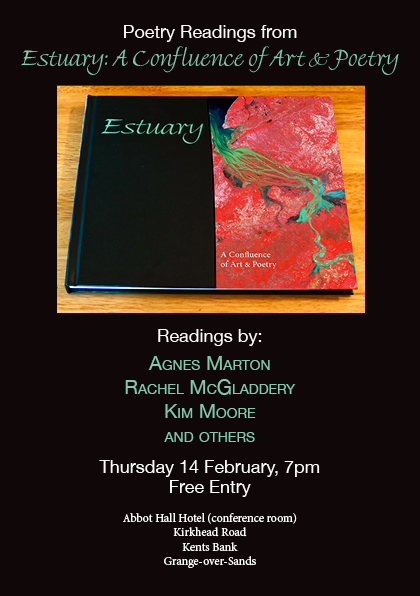 I really hope to see some of you at this reading which I’m taking part in on Thursday 14th February 2013 to launch a new anthology called ‘Estuary: A Confluence of Art and Poetry’. It’s completely free to get in and what better way to spend Valentines Day than listening to poetry? The reading will take place in the Conference Room at Abbot Hall Hotel, Grange over Sands and starts at 7pm. Today I’ve been finishing off the final touches for the workshops that I’ll be running on the residential at Abbot Hall, starting tomorrow! There are now 14 people booked on – I hope they are all as excited as I’ve been. Today I’ve been working on the ‘Journeys’ workshop and finding poems that write about travel and the sea. One interesting thing that I’ve noticed is that the poets who write about the sea write about it a lot. The sea weaves its way through a collection – and it is a constant preoccupation. Perhaps the easiest example of this is the brilliant Kathleen Jamie. I have two of her collections – ‘The Tree House’ and the new one ‘Overhaul’. In ‘The Tree House’ there are eight poems that the sea features in – I hesitate to say theme – because often the sea is the setting, more than a them – and there are eight in ‘Overhaul’ as well. And some poets just don’t write about the sea at all – it seems to be one or the other – I searched through some of my favourite poets for sea-themed poetry and couldn’t find any – I won’t name them, because I know someone will pipe up and say ‘Yes, here’s one’ and thus blow my theory right out of the water. It’s been really interesting to see how the sea is used to explore the inner psyche – maybe this has something to do with the fact that not only can you travel across the sea, but you can also travel downwards…but I don’t want to preempt my workshop, so I’ll shut up! Today’s Sunday poem is by one of my favourite poets Penelope Shuttle. I got to know Penelope’s work because in the first ever competition that I entered, the Kent and Sussex, a good four or five years ago now, Penelope was the judge, and she gave my poem a Fourth Place. I went down to Kent to get my £75 prize money and was so dumbstruck by being amongst famous poets, that I squeaked at Penny when she came over to congratulate me, and then I scuttled away. After that, I started reading Penelope’s work and she is a poet that I often come back to when I’ve had a busy time that has meant that I’ve moved far away from poetry, or feel like I’ve moved far away. Like January for example – when I didn’t write any poetry because my energies were somewhere else – but as soon as I had a bit of breathing space, without thinking about it really, I went and re-read ‘Sandgrain and Hourglass’ – Penelope’s 2010 collection from Bloodaxe and I had the feeling that I have had in the past from this book – of my brain slowly being cleared of the mundane, the trivial and the unimportant things, leaving a lovely empty space in my head in which I can start to write and think again about poetry. I don’t know why Penelope’s poetry has this effect on me. There are other poets too who do this to me – Kathleen Jamie is another one – it’s like a feeling of calmness that comes over me – and we all need a little calmness right? Here is the poem – tomorrow I’m off to the dizzy heights of Grange Over Sands. Wish me luck! Anybody who is within striking distance of Ulverston should really head over this Saturday to see the wonderful Tony Curtis performing at A Poem and A Pint, this Saturday 9th February, starting at 7.30pm at the Coronation Hall in the Supper Room. It would be lovely to see some of you there. There is no open mic this time, but the committee will be providing five minute floor slots- so that means I’ll be reading! I don’t know what yet – I don’t like to be too organised, and after all it is only Thursday. Today has been a hard day – I drove to Kendal to do 2 hours whole-class brass teaching in the morning, then back to Barrow to do another 2 hours whole-class brass teaching there, and then straight back to Kendal to do a 2 hour Inset session. I feel like I’m coming down with a cold – feel really run-down, but am determined not to be ill over half term. That would be too cruel! I’ve had a dodgy foot since Sunday which I have, to be fair been MOANING about, mainly because I’ve been hobbling about, and limping is really bloody exhausting – it basically feels like I’ve got a bruise on my foot. Anyway, I went to the doctor’s yesterday, feeling like a bit of an idiot, and the doctor said I have plantar fasciitis so am on heavy duty anti-inflammatories. I feel slightly guilty as my plantar fasciitis problem has trumped hubby’s glued-up-hole-in-his-chin problem (see previous post) and he’s been having to walk the dogs all week as I can’t put any weight on one foot. However he saw the dentist yesterday, and they think he can just have a cap on his tooth which will cost £200 (!) and hopefully the teeth won’t fall out. I thought it would make more sense to wait and see if the tooth falls out first before putting the £200 cap on it, but apparently not – the tooth will just get weaker if it is not capped. I am now off for an early night (again). I know I will see some of you on Saturday at Poem and A Pint, and I will be posting up a really beautiful Sunday poem this Sunday from one of my favourite poets – but you will have to wait to find out who it is. Evening everybody. I’m now tucked up in bed writing this after a marathon weekend – in fact a marathon January where I seemed to be doing everything but writing poetry. However, on Saturday, I got the 6.20 am train again to Sheffield and went to the Poetry Business Writing School workshop – this is an 18 month course that I’m doing and we have a workshop every other month. I’m really enjoying it so far, and by the time Saturday came around, I was itching to get out of Barrow, and have some time to do some writing. That is a misnomer though, because there is always ‘time’ to write – but I’ve found through January, that when I’ve had the time, I’ve just not had the energy – so I was really ready to write – I knew I had something to say. That is the great thing for me about workshops – the exercise is really just an open door, or a way in to what ever subject I really want to write about. The other poets on the course are really, really good as well and I really like hearing the different things they’ve come up with for each exercise. Ann and Peter are great tutors as well – I know they are now my publishers, so I’m biased maybe, but I love the way they are so careful to include everybody, they are unfailingly interested in people’s writing and are in general the type of people who send you off with a warm glow after being around them. Anyway, that was Saturday – and I think I managed to write two or three poems, or first drafts of poems anyway. I say ‘think’ because I can never tell at first whether what I’ve written will be a poem, and I’ve not had time to look back through my notebook, or type them up since then – that is going to be my job tomorrow on my day off work. I got back at 9pm on Saturday, and then went straight down to the pub to meet up with Dave Boroston, one of my oldest friends from music college, a really good trumpet player who’d come up from the Midlands to do an all-day jazz workshop with the Junior Band on the Sunday, so then I have to get my head out of poetry, and back onto teaching, and timing, and structuring a session etc. Anyway, Dave had brought his friend Tom up to play piano, and today they’ve ran a workshop all day for the children. By the end of the day, every single band member had improvised around a 12 bar blues, which is pretty scary if you’ve never done it before, so I was really proud of them. I’ve just been back at the pub with Dave and Tom and they’ve been going on about how well-mannered the kids are in the band, and how well-behaved they were and enthusiastic so I’m made-up that they gave such a good impression of themselves. It was a long day as well 10-4 and the youngest children there were year 4 – so they did so well to concentrate all day. So I’m pretty shattered now – and I think I’m coming down with something – sore throat, slightly dizzy, headache, and bizarrely, a bruised sole at the bottom of my foot on the heel, which sounds bizarre, but it’s genuinely painful enough that I can’t put weight on it. It sounds ridiculous I know but there you go. Anyway, in honour of what we’ve been trying to do all day today, which is to show children that music is for them, that they can improvise, that it is not always important to be ‘wrong’ or ‘right’ but that the process of making music is more important, which is ultimately about expression, I’m very excited to be able to post a poem by Clare Shaw on the blog this Sunday. Clare is one of my favourite writers and performers and if you haven’t been to see her read, make the effort because she really is quite an unforgettable reader. Her website is http://www.clareshaw.co.uk/3.html if you would like to see more of her work and find out more about her. The poem that I’ve chosen for today comes from her new collection ‘Head On’ published by Bloodaxe books but I would also recommend her first collection ‘Straight Ahead’ also from Bloodaxe. This poem is very quirky but it kind of fitted with what was happening today as well – the struggle of the children to break free of constraints and self consciousness resonates with the Tree in this poem, who is ‘tired of being Tree’. I love some of the images in this poem – the rooks and the ship at the end. I can identify with this tree! Anyway, here is the poem – I hope you enjoy it. Tree wants to be something else. the way a cello does, or blood. though she yearns for it more than the world. Their earnest intent to do good. if it kills her. But not tonight. She is done with trying so hard. Tree wants to be irresponsible and inconsequential. Tree wants to do wicked things. or save her or change her.